Proverbs 12:3 (NKJV) A man is not established by wickedness, but the root of the righteous cannot be moved. Here’s a little follow-up from yesterday’s blog on “waiting”. I posted that blog in the morning and then later that day I found myself (you guessed it) waiting…waiting in line at a grocery store. It was about as exciting as watching an oak tree grow. It was about as satisfying as watching a pot of water on the stove–waiting for it to boil. It was at least as fulfilling as inching along at a snail’s pace on the interstate during the Thanksgiving season (though I’d remind you that that’s coming up soon \\ you can thank me later). Well you get the picture. But here’s the deal; the reason I was waiting in line was to buy flowers; flowers for a wonderful lady that had invited Sonja and I over for a special home cooked meal–it was the least I could do. In other words, what I was doing was the right (righteous) thing to do. Today’s proverb teaches this in a much more succinct way. It states, you can go faster by cutting corners, telling lies, practicing shady business, etc. but you will not be (get this) established. Sooner or later the wicked man or woman has to pay up. Actually, there are no short cuts. We don’t break the laws of God unnoticed (Psalm 9:17-18); ultimately we have to give an account. If you see someone living a wicked life just know they’re living on credit (mercy) right now–God is giving them time to hopefully come to their senses and change. On the other hand, the one that lives righteously cannot be moved. Why? 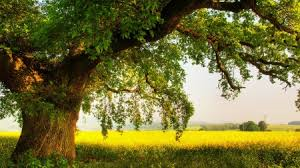 Because, like an oak tree growing, every wise and righteous decision strengthens and grows God’s character in them. They are free from looking over their shoulder wondering when people will catch them. They’re free from wondering if and when the tax man, the debt collector and the unhappy customer will come calling. They never toss and turn at night wondering if and when someone is going to expose them. In other words, they are established. Doing the right thing is often about as exciting as watching an oak tree grow, but oh it is very rewarding over the long haul. The ONE THING for today: Do the right (righteous) thing. Tags: oak tree. Bookmark the permalink. A thousand years is like one day to God. He is patiently waiting for the Bride of Christ Jesus to get her spots and wrinkles out her bridal gown. The Holy Spirit is the great Spot Remover.